The football franchise on the consoles comes to the Sega Genesis with JOHN MADDEN FOOTBALL. Choose from all 28 professional teams and play a Season, Playoff, or Sudden Death game. In all of the modes, you can execute a variety of offensive and defensive plays. 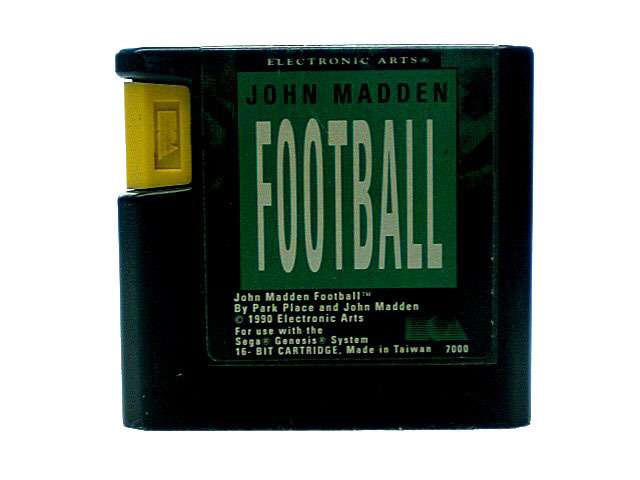 Get into the action with JOHN MADDEN FOOTBALL. John Madden Football ushers in a new era for football games on the home console. The game is played from above and behind the quarterback rather than from the side, and a unique system of passing windows allows you to zoom in on three receivers. Seventeen professional-caliber teams are included with realistic players rated in several categories, and over 100 plays can be called from an on-screen playbook. Other notable features include variable field conditions such as mud, rain or snow; three pre-determined audibles per team; and a playoff mode that can be continued via password. While the game does not include NFL or NFLPA licenses for authentic teams or player names, John Madden himself will present the stats for your team at half-time and at the end of the game.